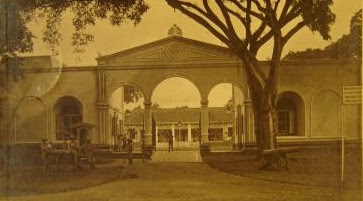 Kuta Besak is the center court Palembang Darussalam Sultanate, as traditional power centers that experienced the change from middle age into a new era in the 19th century. Understanding Kuto here comes from the Sanskrit word, which means: The city, castle, fort, stronghold (see 'Dictionary of Ancient Java - Indonesia', L Mardiwarsito, Nusa Indah Flores, 1986). 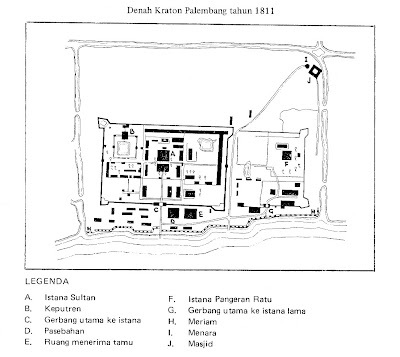 Melayu Language (Palembang) seems to put more emphasis on the meaning of the castle, fortress, stronghold kuto meaning even more defined in terms of the shape of the high fence wall. While understanding more of the country translated. 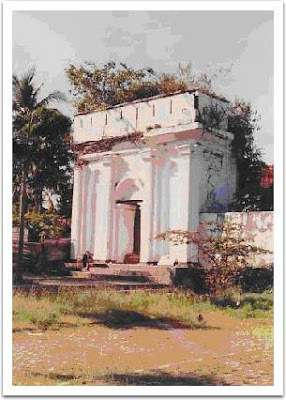 The fort was founded in 1780 by Sultan Muhammad Bahauddin (father Sultan Mahmud Badaruddin II). This idea comes from the fortress of Sultan Mahmud Badaruddin I (1724-1758), or known by Jayo Wikramo, who founded the Old Palace Kuta in 1737. This castle development process is fully supported by all the people in South Sumatra. They also donated building materials and labor executive. Who was the architect, is not known with certainty. There is the suggestion that the architect was the Europeans. For monitoring the implementation of the work entrusted to a Chinese, who are experts in their fields. As a material for the adhesive cement brick limestone is used in rural areas Ogan River. Limestone material landfills are located in the back of the Land of the Kingdom which is now called the Kapuran Village, and creeks are used as a means of transport is Kapuran River. In 1797, the castle was finished, and began formally occupied by the Sultan Muhammad Bahauddin on Monday, 23 Sha'ban 1211 Hijri in the morning or in conjunction with the February 21, 1797 AD. 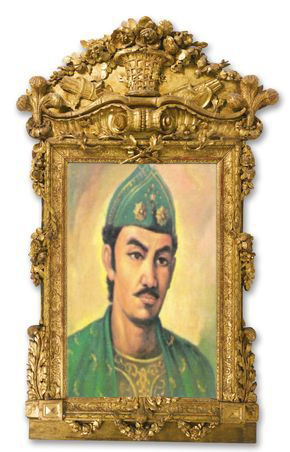 Meanwhile, the oldest son, who became Prince Queen (Crown Prince) occupies the Old Palace Kuta. In the War of 1819 the first Palembang, the fort was tested by cannon shells Dutch corvette, but not one bullet that can penetrate both walls and doors. Due to run out of bullets and gunpowder, then the Dutch fleet escaped to Batavia. From this was born the phrase, which states that work for nothing, because it does not bring results: ration runs out, no ne of Palembang, means the act or attempt that did not give results, only brought loss and fatigue sernata. This event is written with great charm in Menteng War poem or a poem also called the War of Palembang. In addition to beautiful and sturdy, Kuto Besak is located in strategic places, namely in the fields like floating on the water. She lies on the "island", ie the area surrounded by the Musi River (in the front or south), in the western part limited by Sekanak River, bounded on the east Tengkuruk River and behind, or the northern part limited by Kapuran River. This area is called Land of the Palace. 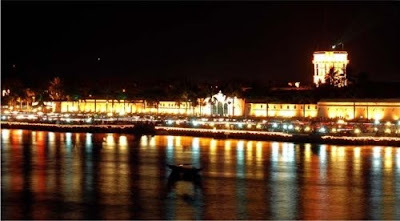 Forms and soil conditions in the city of Palembang as if to the islands, and by the Dutch people gave him the title as the de Twintig Eilanden der Stad (City of Twenty-Island). 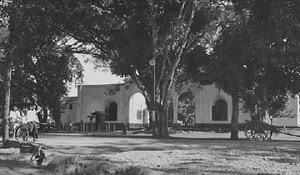 Further according to G. Bruining, the island's most valuable (dier Eilanden) is the place Kuto Besak, Kuta Lama and the Great Mosque stands. 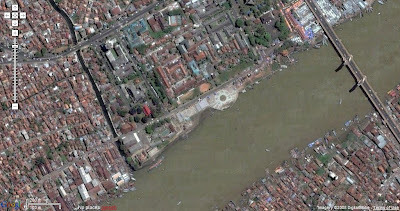 Formation of the islands in the city of Palembang is because the number of children who crossed the river and cut the city. 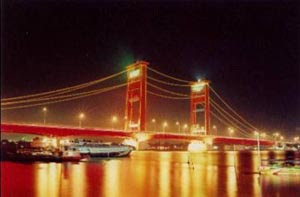 Naturally also called the City if Palembang River Hundred. 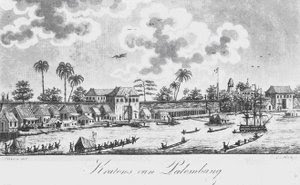 Whereas in the early colonial era, Palembang dubbed by them as het Indische Venetie. Another epithet is de Stad des Vredes, namely a peaceful place (meaning Dar's Greetings). And indeed this is the name of the official name of the Sultanate of Palembang Darussalam. According I. J. Sevenhoven, the first Dutch commisaris Regeering in Palembang, Kuto Besak roede width and 77 length 49 roede (Amsterdamsch roede = approximately 3.75 m, or the length is 288.75 meters and 183.75 meters wide), with a strong wall around and the height and width of 30 feet 6 or 7 feet. This wall is strengthened with bastions 4 (bastion). Inside there was a similar wall and nearly as tall, with the gates strong, so this can also be used for defense if the first wall can be broken (see LJ. Sevenhoven, Painting, page 14). Recent measurements of the consultants themselves have a slightly different size, which is 290 meters long and 180 meters wide. "... 77 roede width and length 44 roede, equipped with a 3 and a half bastion bastion management, which complements a wall around all four sides. Walls are thick and 5 feet high from the ground 22 and 24 feet. At the time of the war against the Dutch colonialists in 1819, there were as many as 129 shoots a cannon was on the wall Kuto Besak. Whereas during the war in 1821, only 75 shoots a cannon on the wall Kuto Besak and 30 shoots along the river wall, the attackers threatened standby.